New pricing, more trip requests & NO COMMISSIONS* for GrabCar Premium! Great news! 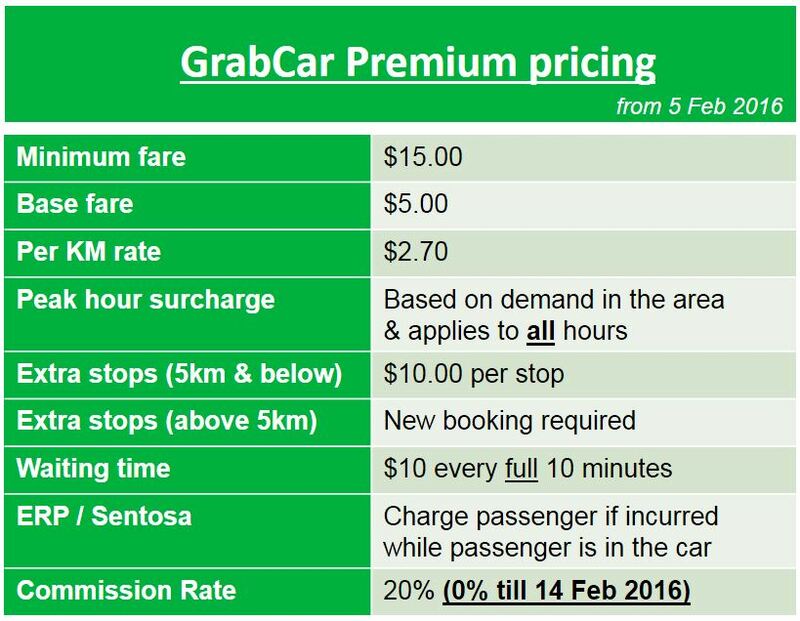 GrabCar is revising GrabCar Premium prices so our partners get MORE TRIP REQUESTS! We’re also waiving all commission charges from 5 to 14 Feb 2016 (inclusive)! Q1: Do I need to do anything differently from before? Yes! You should (i) charge $10 per extra stop (ii) include ERP/Sentosa charges incurred while passenger is in your car. Q2: Will I still see a fixed fare? Absolutely! Q3: Should I expect to get many trip requests? Definitely! We have many promotions & campaigns lined up – so stay tuned for more trip requests coming your way! Q4: How do I get more trip requests? Have you activated GrabPay so you can receive credit card trip requests? If not, visit bit.ly/GCSGGrabPay to get activated! It only takes a few minutes! Q5: How are peak hour charges calculated? Any time could now be a peak hour – you’ll see higher fixed fares quoted whenever there is high demand & few drivers in your area. This means fares could be higher than before! Q7: How can I be eligible for 0% commissions?You’re already eligible for 0% commissions on all GrabCar Premium rides! Just start Grabbing now!